“I hope that this centre provides young entrepreneurs with the education and confidence to succeed, create the future and improve life.” John F. Wood Donor, Business Leader. 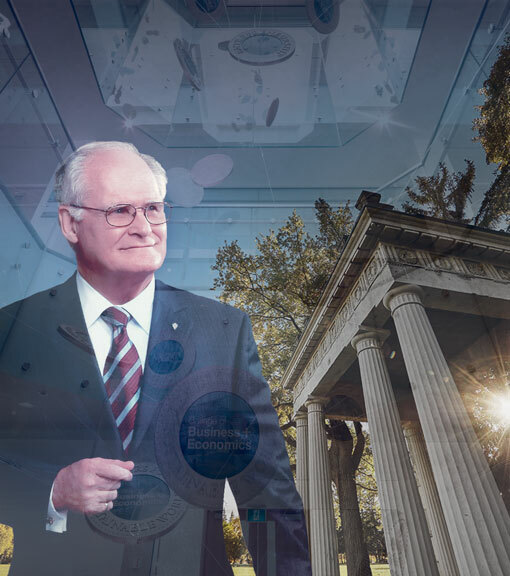 The University of Guelph’s Centre for Business and Student Enterprise has received a groundbreaking, $7-million gift from John F. Wood, allowing the University to play a leading role in developing a new generation of business leaders focused on entrepreneurship and innovation. The gift – the largest-ever for U of G’s College of Business and Economics (CBE) – will create the John F. Wood Centre for Business and Student Enterprise. “This transformational gift will allow the University of Guelph to redefine the future of business education,” said U of G president Franco Vaccarino. The John F. Wood Centre for Business and Student Enterprise will provide current and future students with access to the latest innovations and methods for teaching business effectively in an ever-changing world, Vaccarino said. Students from any discipline – science, arts, business or social sciences – will also be able to identify a need, develop a solution and bring it to life. “Thanks to the generosity of John Wood, we will be better able to support and inspire our students – everything from new approaches to teaching and learning in business, to more opportunities for interdisciplinary collaboration, to increased financial support for their innovations, to access to leading teachers and mentors,” Vaccarino said. John F. Wood was president and chief executive officer of W.C. Wood Co. Ltd., which was among North America’s largest appliance manufacturers. “I hope that this Centre provides young entrepreneurs with the education and confidence to succeed, create the future and improve life,” Wood said. Among the elements funded by the gift are two new academic chairs in entrepreneurship and community engagement. In addition, students and alumni will have access to start-up funds, space and mentorship for starting businesses through the Hub Incubator Program. “It's incredibly inspiring to have a successful Canadian and global business leader like John Wood support our college,” said Julia Christensen Hughes, CBE dean.